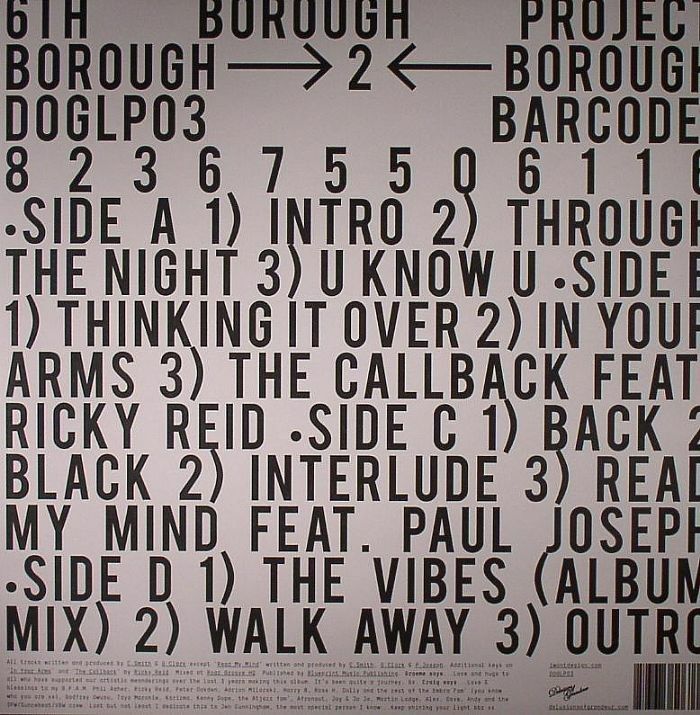 Everything about 6th Borough Project’s long-awaited follow-up to their debut LP is refreshingly low-key. Coming from two accomplished producers in their own right – The Revenge and Craig Smith – it is a masterfully restrained sophomore album, every bit as genteel and tasteful as you’d expect. The serene spoken-word intro sets the scene, instructing us to ‘sit back, relax and enjoy the show’. And it is true, much of the album could fall into the ‘easy listening’ bracket. But these are gentle grooves groomed for the dancefloor (or at least born of the dancefloor), no matter how low-slung or off-kilter they might appear. Take ‘U Know U’, an achingly simple slow-burner that revolves around a sluggish but stomping house beat and some delicious mid-range gurgles of bass. It’s repetitious, propulsive nature is perfect for any attentive warm-up DJ gradually upping the ante during early doors. ‘Think It Over’ is equally as steady, pushing a resolute groove and clipped vocal. The obvious highlight is the album’s first single, ‘In Your Arms’, which boasts the biggest hook: sun-drenched, dramatic piano keys and a catchy female vocal loop that rises and drops with flutters of disco percussion. It’s the sort of warm and tender track that’s impossible to dislike. Elsewhere the album benefits from smatters of organic instrumentation decorating the chugging tempos. ‘Back 2 Black’ for instance has a discreetly African flavour thanks to the bustle of chiming cowbells, whilst ‘Walk Away’ works a languorous sax line. Crucially, the disco samples are never overdone; they serve to add a little colour, along with the swathes of warm bass, but never upstage the focal-point: a locked funk groove. The album is remarkably similar to their first. This is not a criticism; Borough 2 Borough proves that when it comes to the now popular house-disco fusion, no one does it better than Graeme Clark and Craig Smith.